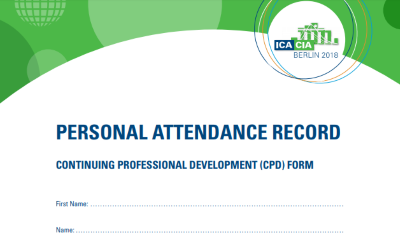 The ICA 2018 has prepared a CPD Form, which you can print download and print here. Attending the ICA 2018 has given you the chance to participate in many sessions on latest topics in research and academia in actuarial ?elds. This form should give you the possibility to get your participation recognized as further education in your home association. In total, 31 hours of CPD could have been achieved by attending the full week of the ICA 2018. First half week attendees were able to reach 22 hours of CPD, whereas second half week attendees coud have reached 21 hours of CPD. On the following pages, you can document the sessions, you have actually participated in. For recognizing these sessions as CPD in your personal CPD record at your home association, please contact your association directly.